In the midst of uncertain and unsettling times, the joys of finely crafted short stories wherein mayhem, murder, and the miscarriage of justice are craftily resolved, are a welcome respite. Peter Robinson is a fine British crime writer whose tales are atmospheric and psychologically complex gems. The title story, Not Safe After Dark is a brief but gripping tale. Several of the stories feature DCI Alan Banks, a character somewhat reminiscent of Michael Connelly’s Hieronymus Bosch, both in musical taste (from Miles Davis to Bach), a slightly world weary outlook and rather fraught love life. The volume ends with a moving novella in which Banks goes to his childhood home for his parents’ 50th anniversary. All in all this collection of twenty stories has given me many hours of lovely escape. From the New York Times bestselling author of Sleeping in the Ground comes this brilliantly nuanced short story collection of twenty stories--most never before published in the US, and one of them an Edgar winner--which also features three Inspector Banks tales. Peter Robinson pens thrilling tales rich with keen observations, pitch perfect dialogue, and shocking plot twists that have fascinated readers all over the world and made him one of the greatest suspense novelists alive. His acclaimed novels featuring Detective Inspector Alan Banks rank among the most celebrated police procedural series in modern fiction. 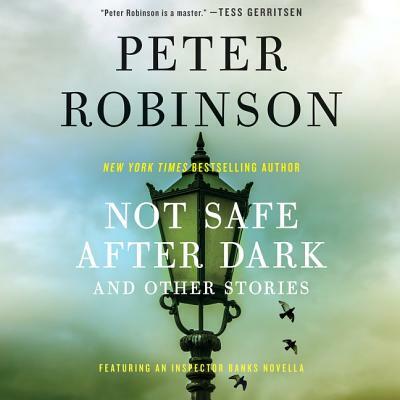 In Not Safe After Dark and Other Stories, Robinson showcases once again his extraordinary talents with a collection of twenty stories, including three featuring Inspector Banks.In "Going Back," Inspector Banks' trip to celebrate his parents' Golden Anniversary reveals how evil can wear many disguises. In the Edgar Award-winning "Missing in Action," the disappearance of a young boy in the early days of WWII sparks a mob mentality with chilling results. "Innocence" captures the desperate plight of a man trapped by a set of coincidences that derail his life and lead him down a path he was destined to travel. The title story, Not Safe After Dark, is an exhilarating tale with a sudden conclusion that will leave readers' hearts pounding. Not Safe After Dark and Other Stories deftly explores the darkest edges of humanity in which everyday people must commit desperate acts as they face fear, temptation, and impulses too irresistible to control. Publisher's note: Peter Robinson is both a widely acclaimed and internationally bestselling novelist and an Edgar-winning author of short stories. This special edition of Not Safe After Dark collects 20 of his finest short stories -- previously published in different editions under the same title, but never before available in its entirety in the US. The new Not Safe After Dark is a publication to be celebrated by Robinson fans and newcomers alike.